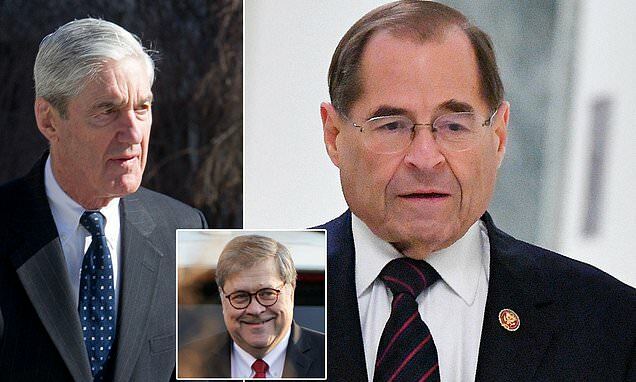 Six powerful House committee chairs signed on to the letter, which was released by House Judiciary Chairman Jerry Nadler, who received Barr's letter laying out Mueller's findings. 'Your four-page summary of the Special Counsel's review is not sufficient for Congress, as a coequal branch of government' to do its work, the chairs wrote. Each of the committees involved in the request - House Judiciary, Oversight, Intelligence, Financial Services, Ways and Means, and Foreign Affairs - is engaged in some type of oversight of President Donald Trump's administration. 'We look forward to receiving the report in full no later than, and to begin receiving the underlying evidence and documents that same day,' they write. 'The provision of the report - in complete and unredacted form - and the underlying evidence and materials would be fully consistent with the Justice Department’s practice and precedent with Congress, which the Department reinforced in recent years,' they wrote. 'This administration was not going to indict the president,' Cummings told reporters on Monday evening.